Even though I very much dislike its franchiser in Turkey, Shaya Group, my love for Starbucks Coffee, as a café, is no secret. I would not call myself a coffee enthusiast or an espresso guru; and frankly, I am not THAT into it; but pretty much like everyone, I appreciate an occasional cup of fine coffee. Starbucks may not offer the finest cup of coffee, yet there is more than that to notice. First of all, I am in love with the concept of “Barista” (I don’t know the name of its female version actually, what might it be, Baristess? Baristette? well…) and their cute attempts to learn your first name and your favourite drink if you are a regular. Normally, it is supposed to be depending on the Starbucks you are at, but it is not. Or maybe I am just way too lucky, I don’t know. Maybe they’re programmed to BE so? Too much sci-fi, I know. But the thing is, they have this certain way of making you feel warm and (kind of) at home (only with a slightly better decoration and lighting). Perhaps their behaviors towards customers cause some kind of hormone to be discharged and leads to a misperception of better taste..? But in the end, it just tastes the way it should taste every single time and I love to have such constant in my not so hectic life. My favourite beverages for the winter time (there really is not much of a “winter” going on either in Bodrum or in Alanya, but still) are americano with irish cream and of course chai tea latte. And during the summer, I have only one favourite and that is Mango Passion Fruit Frappuccino with raspberry syrup as extra. It tastes like heaven… but not the Nordic idea of heaven, more like the Arab heaven with its freshness and coolness. And as a bonus, no matter where you order this particular drink; the barista always tell you that it was an excellent choice. I have ordered this very same beverage in more than 20 different Starbucks’es and received the very same feedback. (Maybe it is company policy? :) But it really feels nice, especially for the ones like me whose biggest accomplishment in life is to order a drink that tastes extraordinarily good. If you still have some second thoughts, just take a look at it! Plus, I just want to make one more thing clear; people around me have a tendency to boycott Starbucks just because(!) it has shut its doors to Gezi protestors in their time of need. Honestly this is unacceptable for such public brand, and could be a deal-breaker for many. But I wouldn’t give a sh*t about it even if they were having baby fetus grill for dinner. Because you know, love is blind. And deaf. Well, let me know, OK? 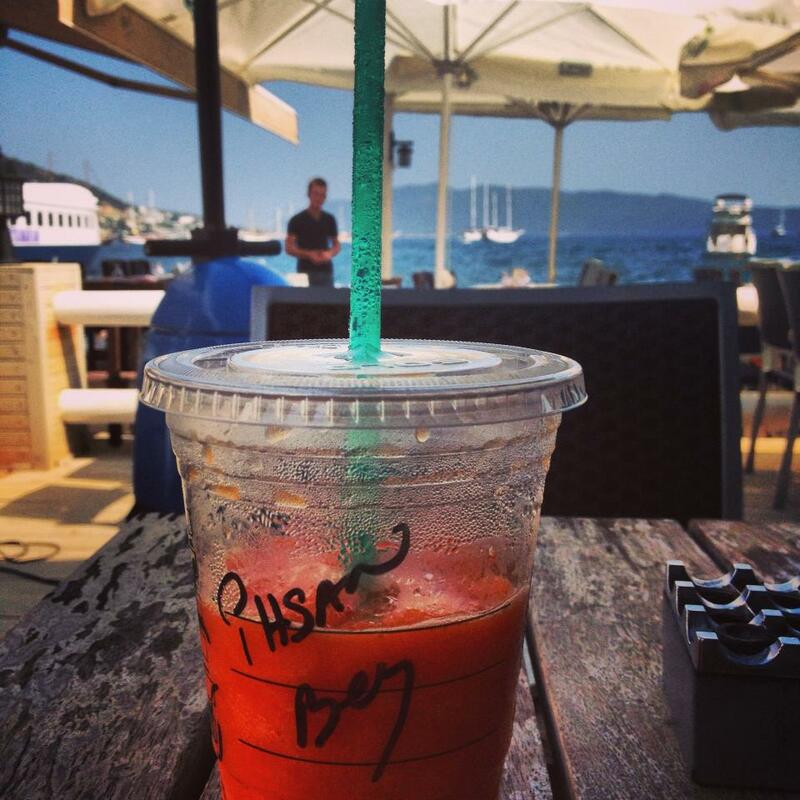 This entry was posted in Food and tagged alanya, americano, bodrum, cafe, coffee, frappuccino, starbucks by Ihsan Berktas. Bookmark the permalink.